Burleigh County uses LoadPass Permits to issue all overweight and oversized truck permits. LoadPass Permits' website can be accessed at https://www.loadpasspermits.com/ . For questions regarding the permitting process please call LoadPass Permits at (701) 566-5576. Notice is hereby given that the Burleigh County Board of Commissioners have resolved that seasonal load limits will go into effect on Wednesday, March 20, 2019 at 8:00 a.m. and will continue until further notice. All paved Burleigh County roads have a 6 ton/axle (80,000 lb. max) load restriction except County Hwy 10 (from 66th St NE, east to US Hwy 83), 158th St NE (from I-94 to just south of Apple Creek Road), North Centennial Road, 71st Ave (from Centennial Road to US Hwy 83), 136th Ave NE (from US Hwy 83 east to the first road approach on south side of 136th Ave NE), 236th St NE (from I-94 north to 30th Ave NE), 30th Ave NE (from 236th St NE east to 249th St NE), 249th St NE (from 30th Ave NE north to 1.5 miles north of 84th Ave NE) which are restricted by Legal Weight. All gravel roads have a 7 ton/axle (105,500 lb. max) load restriction except 227th Ave NE (from US Hwy 83, east to 26th St) and 227th Ave NE (from 171st St NE east 1 mile to the township line) which have a 6 ton/axle (80,000 lb. max). All roads in subdivisions have a 5 ton/axle (80,000 lb. max) except roads in industrial subdivisions (Andre Ln, Andre Loop, Beech St, Carbine Dr, Cartridge Loop, Cavalry Dr, Centurion Dr, Fuller Ave, Hemlock St, Industrial Park Dr, Rifle Range Dr, Saber Dr, Saber Loop, Saber Pl, Sky Way, Skyhawk Ave) which have a 7 ton/axle (105,500 lb. max) load restriction. Enforcement will be by ND State Patrol. That the County will no longer allow Self-Propelled Earthmoving Equipment to be moved un-trailered on County roadways. THEREFORE BE IT RESOLVED: As of January 1, 2019 Burleigh County hereby adopts the LoadPass Permit system and authorizes the proper County officials to enter into an agreement with the Western Dakota Energy Association to operate said system. See below for Weight Restrictions Guide and Chart for additional guidance on legal loading in Burleigh County. 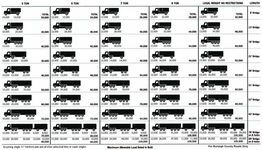 Maximum gross vehicle weight allowed on all Burleigh County roads is 105,500 lbs (See below for exceptions). For heavier loads, click here to access LoadPass Permits' website. Typically load restrictions are in place from mid February through May, but vary each year depending on actual moisture and weather conditions. The County uses the same guidelines, time frame and recommendations as the North Dakota Department of Transportation. Watch for official notices in the Bismarck Tribune each spring.